"Who says iPad keyboards have to run on Bluetooth? Not MacAlly, that's for sure. The iKey30 is a good ol' USB keyboard which sports a 30-pin dock connector on the end of its cable, and comes with an almost ridiculous number of special function keys." Not sure why you would want one, but now a wired keyboard is available from MacAlly for about 50 bucks. 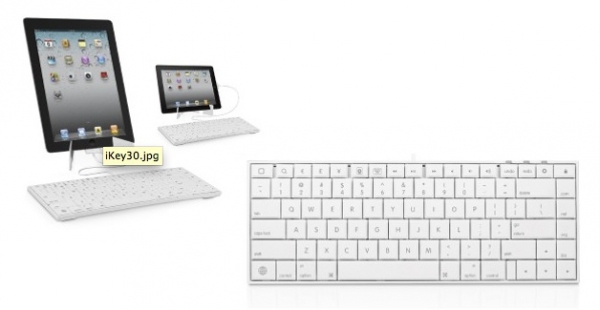 I think I'd much rather get a Bluetooth keyboard that I could also use when I dock my Macbook Air. In reading the Macworld review, they did make the point that if you are in an area where wireless connections are prohibited (such as during certain times on an airplane) it would come in handy. I don't think this outweighs the downside though, what are your thoughts?